Untourists Report from Central Scotland: News and Reviews You Can Use! Our Central Scotland Untour has been running for almost a year now. We introduced it in fall of 2016 as the “Scotland Untour” but rechristened it Central Scotland this summer to make way for our newest offering in Inverness, the Scottish Highlands Untour. From its inception, the (Central) Scotland Untour has gotten rave reviews, most notably for our staff person Val and for the friendliness of the Scots. Here are some reviews directly from our guests there, from both 2016 and the first part of 2017. I hope their apartment info and other suggestions are helpful! Since this was our first Untour experience and we were among the first Untour Scotland guests we really didn’t know what we to expect from Valerie Storrie, the on-site staff support. She was most accommodating and helpful when we asked. The orientation meeting in Dunblane was the perfect introduction to the country since it was a small town, easily walkable. We enjoyed having the freedom to see and do what we wanted to. We also really enjoyed talking with people we met along the way – Scots people and fellow international tourists. Our Untours cottage, the Wallace View, was situated on a sheep farm with a view from the kitchen window to a field of grazing sheep and beyond to the Wallace Monument and from the other side of the house to a field where Henry the Clydesdale and sheep grazed. We mention this because the views were a major part of our positive experience. The cottage itself was perfectly appointed with all that one might desire in a vacation rental. It is conveniently located to the sites in the Stirling area. Val is the perfect choice for local host! We feel that we made a new friend!! Untours will be very pleased with the experience she offers to her guests. Our drivers were also very personable and a pleasure to travel with. We greatly enjoyed our trip. The people of Scotland are wonderfully friendly and helpful. The thing we will remember the most from this trip was how friendly and helpful the Scots are. Mill Creek and Dunblane were perfect for me. I loved the flat overlooking the Allan River and walking to the village every day. The flat was comfortable and very well equipped. Having groceries and a bottle of wine in the fridge was very much appreciated. Val was the best! Always available by phone or in person to help if needed. Great communication by text and emails too. Val and her colleague Moe made sure everyone was pleased. I can’t say enough about the Untours staff. Cathrin was always helpful and Val was an absolute gem! She helped me on a couple of occasions and made sure I was all set with the car and the flat. 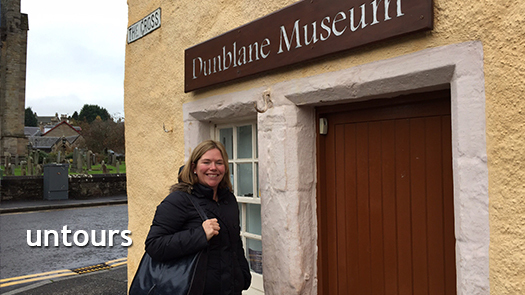 I loved Dunblane and the easy access to the train for trips to Edinburgh and Stirling. I also liked driving to the local castles and distilleries. We had a wonderful time. Though we didn’t drive too far, mostly due to the short October days, we did drive up the Fife coast to St Andrews and to Loch Katrine to cruise on the Sir Walter Scott. We used the train to Edinburgh and Glasgow as it was inexpensive and very convenient. Fun to be in a country that still has real rail service! We enjoyed the food, both old style and new. Our hostess, Val was charming and lovely. We had to phone her a few times early on and she was always cheerfully responsive. We enjoyed the friendliness of the people. And the pride they have in their heritage. Their commitment to the environment. They live amidst ancient history, for which they have deep pride, but they are among the most modern-thinking people on the planet. Val (and Moe) were delightful hosts who introduced us to Dunblane and Scottish culture. Mill Creek is a perfectly lovely place. A comfortable apartment with many amenities, including washing machine and dishwasher, two bedrooms, a big bathroom with a wonderful shower. However, the real charm was the location on the banks of Allan Water. The sound of running water lulled us to sleep. A nearly private terrace outside our windows was right on the river which we watched from a gentle stream to a torrent following several days of upstream rains. Scotland is a wonderful place and the people are the friendliest I’ve encountered. Helpful and warm. I loved the sense of being in a small town, buying the local fare, talking to people in the street, listening to accents accessible and impenetrable. You must visit the Leighton Library in Dunblane. It’s the oldest private library in Scotland and perhaps the world. It is full of first editions of Hume, Gibbon, Locke, Captain Cook, etc. And if you identify yourself as a Yank, you will be shown Paine’s Rights of Man with a dedication to George Washington, and an atlas of the 1775 (note the year) survey of British colonies in North America. We loved the setting of the Mill Creek flat, overlooking the creek. The easy and beautiful walk into Dunblane made for a pleasant trip into town. The refrigerator was thoughtfully stocked for a good start. Although the flat is small, it was clean and had all that we needed to spend a comfortable week. The shower was terrific! Also the location within Scotland lends itself to traveling to lots of other great sights to see. Val was terrific. Her knowledge and insights into the areas to which we wanted to travel within Scotland were invaluable. She sat down with our list of “Must See” places and helped us tackle the logistics of getting there and the best ways to accommodate all that we wanted to do. On Val’s suggestion, we did visit a picturesque fishing village, called Anstruther. We stopped here on our way back from touring St. Andrew’s golf course. While walking along the marina site, we happened upon a Lifeboat Station that gives tours. It was extremely interesting and the volunteers working there in the gift shop were very gracious and generous with their time. The village is a great spot for photos, shopping and food. The Garden View apartment was warm, cozy, and attractively eclectic! The owners are obviously collectors, and I found their mix of styles quite interesting. We were able to fully enjoy a beautiful view of the lush and verdant garden from the sunroom. While there, we were blessed with gorgeous, sunny weather which, we were told, was not the norm, so the garden view was all the more appreciated. A vase filled with fresh yellow roses also welcomed us–a nice touch! I cannot say enough about Val Storrie’s support and guidance! Val met us at the car rental agency. She gave us a few suggestions (food markets, gasoline stations, etc.) and a phone to use to call her with if we needed ANYTHING, and then she lead us to our cottage. What a welcome gesture that was–it was difficult enough not knowing where we were going–but it was absolutely unnerving to be driving on the “other” side of the road! (The roundabouts are another story altogether!) Due to Val’s guidance and attention to detail, we got off to a great start with our Scotland adventure! Over the next couple of days, Val had arranged for our private tour of Dunblane Cathedral, a visit with a “real” Scottish bard, and tea at Tilly’s! These contacts and experiences were top-notch and will provide us with many fond memories…. forever memories! She provided suggestions on restaurants, food shopping, local historic attractions, etc. A highlight was a personal guided tour by David, a member of the Society of Friends of Dunblane Cathedral, which is just a few minutes’ drive from Stirling. Another was meeting Paraig MacNeil, Scots bard and storyteller, who waxed poetic with us over tea and coffee. We also delighted in the delicious treats presented to us by Cathy at Tilly Tea Room in Dunblane! The rest of the week, we–by design–were left to our own devices. We had our own agenda, which was to visit castles and burial sites of our newly discovered–but long-departed–relatives… some of them royals! We took a drive along the sea coast and enjoyed fabulous fish and chips in the charming town of Aberdour. Another excursion was to Alloway to see Burns cottage, birthplace of Robert Burns. Our week in beautiful Scotland went by way too quickly. We had an early departure from Edinburgh, and Ian, our driver, was at our cottage at the crack of dawn to whisk us away to the airport.We loved the stunning, verdant beauty of Scotland and the friendliness of her people, who seemed to want to engage us in conversation everywhere we went. Such a lovely time we had, and we can’t wait to return! Read all about our well reviewed Central Scotland Untour, check out our Scottish Highlands Untour, or consider combining a week in each place for a royal tour of Scotland!